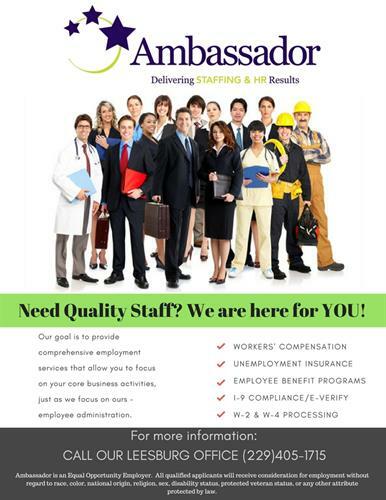 Ambassador is a professional ''full service'' agency for staffing and HR results. Our team of highly trained Business Development Managers,Recruiters and Coordinators are always on stand by to be partners,consultants and offer solutions for your business. Ambassador has over 30 locations in seven states and can boast a privately owned reputation from right here in SWGA. We encourage you to check out our website and our local Leesburg location for any of your HR and Staffing needs.... We are TEAM AMBASSADOR!! 1346 US HWY 19 S. Suite B. Leesburg, GA 31763 next to Pro 1 and Quick Pest Control.